The Inn began life as a nineteenth-century sail loft, part of a working boatyard. Occasional town meetings were held there, as well as the village's first Masonic gatherings. In the 1920s, it was converted to an inn—the Wan-e-set—where tourists from Boston, arriving by steamer, spent long summer stays. The Inn was sold to a succession of local residents in the mid-1950s, but was not fully reopened as a functioning inn until the early 1970's. In 1974, Tim Watts, a native of Tenants Harbor, purchased the now abandoned building, restored it and started the Inn again, under the name "East Wind Inn." 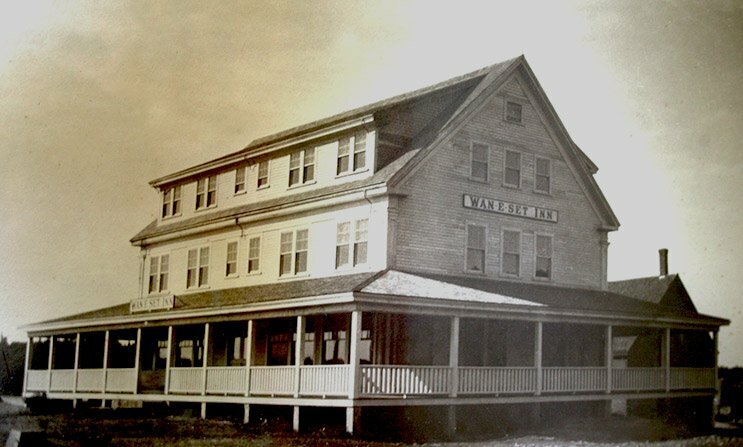 Several years later he purchased an adjacent nineteenth-century sea captain's mansion that had been converted into a boarding house and added it to the inn, calling it the "Meeting House Annex." Tim Watts passed away in 2012 and Randy Deutsch, a long time summer resident of Tenants Harbor purchased the inn. Randy completely renovated the inn, upgrading the rooms and adding modern safety features, while maintaining the historic coastal charm of the inn. Randy enjoys being personally involved with running the inn.